This last week I spent some of my time at college on drafting the block for the Six Frock Coat I am working on. The purpose of doing this is to pull together and accurately draw up the pattern trace I took of the original coat, so I can then make my pattern with seam allowances and everything else that will make it work. I took along my Six Coat from 1985 (see right) to show my tutor where all this started for me, as well as the most useful crib for when I was drawing the block. Being only a teenager at the time, I was quite a bit smaller then, so the only college mannequin it fitted was a ladies size 10! In theory the conjoining of the traced pieces (see left) should be relatively easy - in practice however, it’s a bit less so. 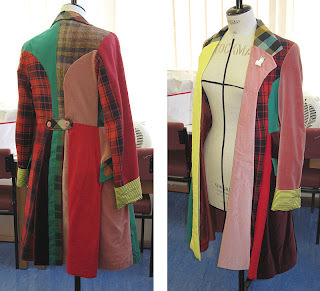 The coat is technically a frock coat, but the waistline seam only goes from above the pockets, stopping short of the front panels. It also has the most unique lapel design, with the roll-line extending right down to the hemline – something I have never really seen before or since, and something about its design that inspired me to make my own back in 1985. To draft the block, I start from the centre back, tracing off the back panel plus the curved side panel and the underarm panel, creating the scye (underarm) line as I go (see right). Below this is then the back tail and the back half of the skirt. Things then start to get a little confusing. Each side of the skirts made from five panels, and they all need to be represented here in their relative positions to ensure the seams are of matching lengths, even if then overlap each other (see left). Finally I add the front panel and lapel area. This is the real tricky bit, but luckily the grid-like design of the tartan helps me with understanding their true shapes, and opening out a couple of important darts that help create the shaping of the front isn’t as bad as I feared, once I had got my mind around it (see right). 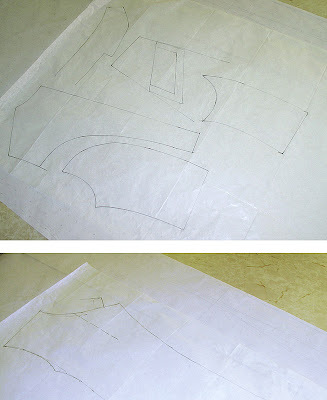 I wasn’t sure how to distinguish the front panel from the lapel, but again once it was on paper it all fell into place. The sleeves will be drafted separately and I will work the collar later once I know the body of the coat is working okay. What I need to do next is extract a pattern from the block, adding my seam allowances as I go, and I can then start making up a calico test to check it all still works.